Red Skye Comics Presents: Agent Nika - Set in an "alternate universe" where The Axis forces defeated both England and Russia during World War II using magical forces infused with science; this is the story of how one of the best agents in this world, Agent Nika, is determined to put an end to their Axis terror in the year: 2038. 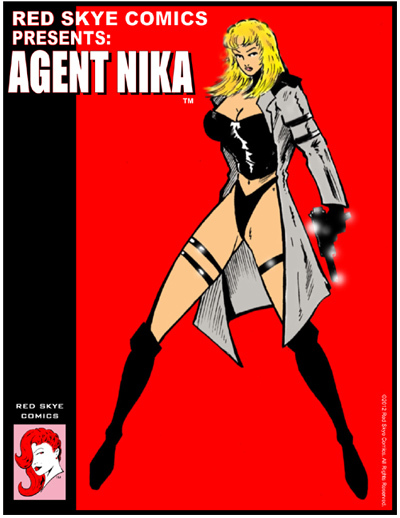 An action packed adventure that takes the reader into a world of urgency and danger, Red Skye Comics Presents: Agent Nika featuring Jemma Jordan is 16 pages with full color cover and b/w interior art. Help support the Jemma Jordan featured model page - You Can Donate Any Amount! ©2004-2015 Red Skye Comics. All Rights Reserved.